We may be the most fortunate people on this planet to have such extraordinarily supportive friends and family. Check out the amazingly creative and fun fundraiser our friends Mike and Sarah Paskin organized for Mike's TriathlonForACure.com to benefit the Gwendolyn Strong Foundation: a catamaran sunset cruise in Santa Barbara. 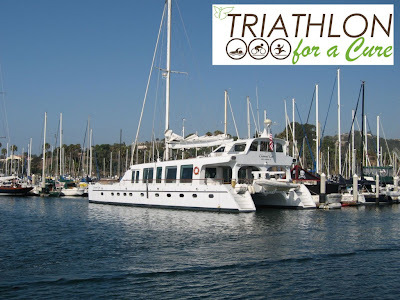 Please join us on October 28, 2009 at 5:00pm at the Santa Barbara Harbor for the inaugural Triathlon For A Cure fundraising event, supporting the Gwendolyn Strong Foundation. Come aboard the exclusively reserved Channel Cat, an 85 ft catamaran, to cruise the Santa Barbara coast at sunset. Rincon Catering will provide hors doeuvres, beer and wine, and a full cash bar will be available. Your ticket onboard is a minimum donation of $50.00 per person with 100% of your tax-deductible contribution going directly to the Gwendolyn Strong Foundation. You can donate by visiting TriathlonForACure.com or by clicking here. Capacity on the Channel Cat is limited to 70 people, so please make a donation and reserve your ticket as soon as possible. Thank you so much Mike and Sarah for creating such a great event. I can't wait to set sail with everyone on October 28!